The Histone H3 Modification Multiplex Assay Kit (Colorimetric) (ab185910) is a complete set of optimized reagents to detect and quantify up to 21 modified Histone H3 patterns simultaneously in a simple, ELISA-like format with use of a standard microplate reader. 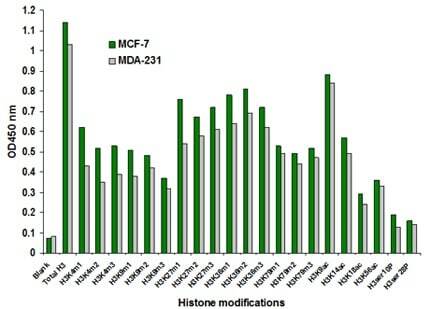 Histone extracts were prepared from MCF-7 and MDA-231 cells and multiple Histone H3 modifications were screened and measured using the Histone H3 Modification Multiplex Assay Kit (Colorimetric). 100 ng of total histone proteins were used. Publishing research using ab185910? Please let us know so that we can cite the reference in this datasheet. signal. The background was very low even with brief washings.